A new superfood bar hit local store shelves and countertop displays in April of this year. A NEW CRUNCH The Pinyon Superfood Bar is not only made with all natural ingredients but it's also made sustainably. It all started with a trip to the Grand Canyon and a long-lasting interest in Native American culture. Rafael Pintor, now a senior at Cal Poly, visited the national park with his family. As he soaked in the vastness of the land, he thought about how native people survived out there back in the day, when there weren't any tourist stops for food. The tour guide pointed to a tree—the tree wasn't very tall, it kind of looked like a bush, and it was covered with pine cones. The guide told Pintor that those pine cones contain seeds called pinyon, and those seeds have been used for thousands and thousands of years. Pintor's next question was where to buy the seed? He discovered that the seed can't be bought in Southern California, the Central Coast, or Northern California. It stays native to its land. From that visit, Atsá Foods was born, a company created by Cal Poly students that focuses on the sustainability of its product as well as how the product is made. The vice president of marketing and design for Atsá Foods, Sam Baber, said the company launched because of the vision that Pintor had. "Basically, it started because Rafael saw it as a way to bridge the gap between creating economic development in a lot of regions that are Native American communities or rural communities. But it's also creating development in those areas that is culturally relevant and not just something obscure," Baber said. He said that the founder of Atsá basically looked around and realized there was a nut growing over thousands and thousands of square miles that's just falling to the ground every year, and no one is harvesting it. "It's growing wild, it's growing sustainably, it's nutritious, healthy, and nobody is using it," Baber said. 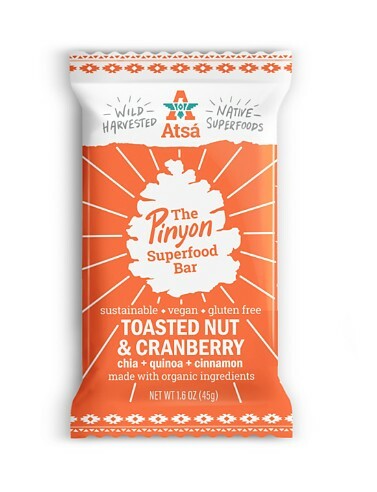 With the pinyon nut, Baber said the company was able to create a The Pinyon Superfood Bar. Its main ingredients are the pinyon toasted nut, cranberry, chia, quinoa, and cinnamon. The pinyon nuts are harvested in the fall in Nevada. Baber said that because the pinyon nut is a wild crop, the harvest moves around every year, so it's not repeated in the same region. The company keeps its harvesting areas discreet because the crop is wild and anyone can harvest it. Currently, Baber said, Atsá Foods connects with a distributor who works with people on the ground in the communities that harvest the crop. The company's connection with its workers in the Nevada area is something Atsá is working toward changing. "It takes a long time to build that kind of connection, especially with people in close-knit communities, so right now, we're basically having people connect us with other people. Eventually, we're trying to have that connection built by ourselves," he said. The Pinyon Superfood Bar is available at local coffee shops, delis, and some stores in the downtown SLO area. The company is also selling its product in Santa Barbara. Atsá is also releasing new flavors in the fall: coconut almond wild berry and dark chocolate berry. To learn more about the superfood bar, visit atsafoods.com.